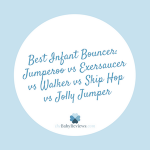 Today we are taking a look at some of the most popular baby co-sleepers/loungers out there. 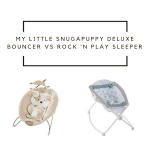 For the purposes of this baby co-sleeper review, we will be covering the Snuggle Me Organic Co-sleeper, Dockatot’s Deluxe Co-sleeper, and the Boppy Newborn Lounger. We have taken the time and researched each product so that we could bring you a definitive ranking and winner. All three of these infant pillows have a big online following, comparable customer ratings, and similar warranties. Since they are so evenly ranked with customer satisfaction, we will skip right ahead to our review of their specs, pros, and cons. After we are done laying out their virtues and flaws, we will explain how we decided their ranking to help with any questions you might have. Snuggle Me Organic won out simply on quality and follow-through with its promises. The Snuggle Me team know their demographic and they have been at this for a long time. If you are looking for a great co-sleeper with plenty of customization and quality to boot, then you might want to give our #1 a try. Specifications: 26 x 18 x 4 inches. Weight 3.6 lbs. For ages 0-6 months. Patented center sling design gives the sensation of being held when baby is placed in it. Safe co-sleeping, snug fit keeps baby from rolling over and thus out of the sleeper. Helps prevent the startle reflex that wakes babies up. Been around for 10+ years. Comes with reusable travel bag for taking the snuggle me on trips. Portable and good for travel. They offer extra bags, covers and cushions. Winner of Mom’s Choice Award. Keeps baby within reach day or night. Babies out-grow it fast due to its smaller size. You must customize it if your baby is over 25 inches long. While we loved the Dockatot, we could not really get behind all of its claims when it came right down to it and with its more expensive price tag the scale tipped toward our #1 sleeper. Specifications: 18 inches wide x 29-34 inches long. Weight 3.6 pounds. For ages 0-9 months. Helps with crib to bed transition. Helps with tummy time and changing. Keeps baby within reach. Snug and comfy safe space for baby to lounge. Breathable materials to allow fresh air against baby’s skin. Safe co-sleeping, prevents baby from rolling over and out of the co-sleeper. Offers extra covers and travel bags. Been around for 10 years. Offers replacement parts such as: pillows, mattress pads and so on. Removable covers and machine washable. Despite the claims that this can be used as a changing station the sides can get in the way when using the sleeper in this way. Small for the age range that it is for. Does not offer customization and you have to buy the larger option if your baby outgrows the smaller one. The larger option aka the grand is not recommended for newborns in case you were thinking of buying it right off the bat instead of the deluxe. The Boppy Lounger does what it says it does and at a great price. It is a great lounger for play and interaction. 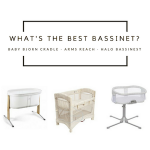 The reason it came in third on our list had to do with the fact that it is not designed for the baby to sleep in, it had no removable cover, and most importantly it did not provide the security of the other two options. If you just want a lounger then the Boppy Lounger is well worth the money. Boppy also makes a great baby chair. Specifications: 18.6 x 7.6 x 12.8 inches. Weight 3.1 pounds. Weight limit of 16 pounds. Allows baby a safe place to kick and play during awake ours. Easily wipe clean fabric for quick cleaning. Easy-carry handle for travel and portability. Baby is elevated in the boppy so he/she has a good view of the world around them. Recessed interior keeps baby comfy. Lounger does not stop baby from rolling out or forward. Lounger is NOT for baby to sleep in. It does not have a removable cover. Baby will outgrow it quickly. A final note for customers considering the top two options. They might seem a bit pricey, but spread that price out over the course of 6 to 9 months then figure in how many hours of help and sleep they might afford you. Plus, with their sturdy quality, they will more than likely be around for multiple children or even to pass on to a friend. We hope that we have hit upon some of the things you want to know about these great co-sleepers and perhaps even helped you make up your mind between them. I was really overwhelmed trying to find the best co sleeper – thank you so much for this review. What is the Dockatot weight limit? The Dockatot weight limit is 22 lbs. I’ve been stressing out trying to find the BEST CO SLEEPER. This article has calmed me down a little bit, I now realize it isn’t necessarily the “best” but instead different products have different features that will appeal to different moms. With that said, I’m definitely going with the Snuggle Me Organic;-) Thanks for your help. I received the Dock A Tot as a baby shower gift and was so excited. Well after a few nights I realized it simply wasn’t going to work out for my baby. He just fought it and fought it. I stumbled across this website a few weeks ago looking for an alternative co sleeper and I’m happy to say that I went with the Snuggle Me Organic and my little guy just loves it! I was looking for something similar to DockATot that maybe wasn’t so expensive. I did even know about the Snuggle Me Lounger, it looks perfect! I’ve been looking for a Dockatot alternative after a friend got one and won’t quit raving about it, but the price tag just won’t fit into my budget. I’m excited to give the cheaper Boppy Lounger a try.